Windows, Android, Mavericks, iOS, these are just some of the world's most popular operating systems, and they all have at least one thing in common: They're all not made in China. Tired of using foreign created software to power their computers, China is looking to promote their own domestically created desktop operating system. As reported on Sina News, a recent broadcast of China Central Television's daily news hour, CCTV reported that the Ministry of Industry and Information Technology (MIIT) is making a push for domestic PC users to jump ship from Windows XP in favor of a domestically created operating system. As of April 8, Windows XP is no longer supported by Microsoft. Updates and security patches for the operating system will no longer come from Microsoft. This news hit China pretty hard as the operating system account for most of the Chinese PC market. According to CCTV, the operating system that the Ministry is pushing is a domestically created operating system based on Linux. The OS is perfectly ready for home use, and CCTV stresses the importance of using a domestically made product. CCTV also used the age old adage of national security to make the domestic operating system more desirable. All of this talk about about a new operating system is actually quite interesting. China's previous efforts into creating a domestic operating system failed miserably. The most famous, Red Flag Linux, shuttered their doors earlier this year. The call to make a Chinese homegrown operating system isn't only tied to the PC space. It's also prevalent in the mobile space. The Chinese government has been looking for ways to get past Google and Android's dominance on the mobile front. Last year, Chinese company Hammer Technologies released the "Smartisan OS". A year later, pretty much everyone is still using iOS and Android. The reason why no one, not even the Chinese themselves are using homegrown software is a simple one. These new home grown operating systems lack a rich developed application ecosystem. China's closest homegrown operating systems for mobile are basically skins of on top of Android. Xiaomi OS, Color OS, any other operating system from a Chinese mobile handset maker is pretty much a skin on top of Android. 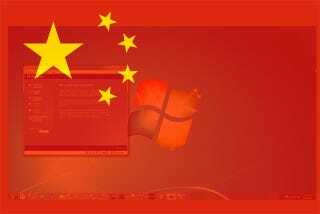 According to the MIIT, homegrown operating systems account for about 1 percent of China's PC market. China's homegrown OS makers have so fared offered their products for free. Red Flag Linux is free compared to the hundreds that Windows 8 costs. OS makers have put the blame of failure on hardware makers, claiming that a lack of hardware support is the reason why domestic operating systems fail. As it stands right now, China is still trying to create its own operating systems. The Chinese government literally runs on Windows, and CCTV says that now XP is over, there's the opportunity for a homegrown product to fill the void. At least six different companies in Beijing are vying to create that operating system. Only time will tell if China will ever create something of their own.